My participation in the bathroom remodel, up to this point, has been mostly to write checks. 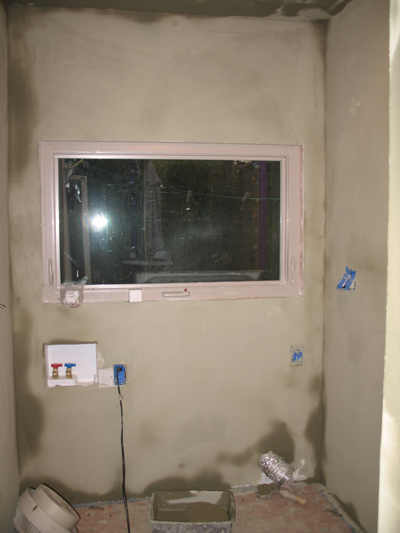 But finally this weekend it was my turn to get my hands dirty: I did the plastering. Messiest job in the whole wide world. There's dust everywhere; blobs and streaks of colored plaster on my clothes, my floors, my face, my shoes, my porch, my front walkway, my car... 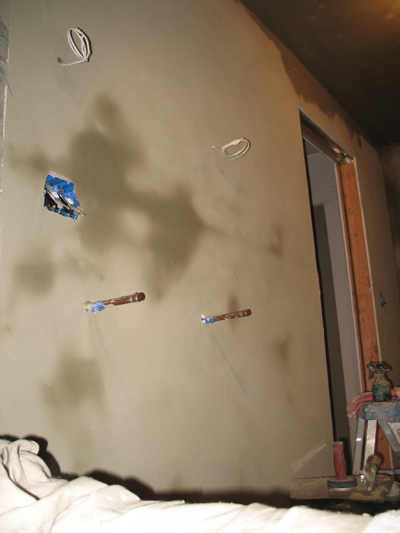 I'm pretty sure I let as much plaster slide off the hawk and drip off the trowel as I actually got on the walls. And the ceiling. Oh my God. My neck is so sore. I used American Clay Natural Earth plaster, wonderful, non-toxic stuff designed to be rustic in appearance (good thing, because there was no way I was gonna get to glassy smoothness with my untrained arm). American Clay is pigmented--in this case, with a color called Napa Olive--so you never have to paint. I hate painting, and I like olive green, so this works out well for me. Plastering is like making mud pies and smearing them on the walls, except for the part where you have to keep going when it stops being fun. Those copper pipes? Part of the hot water system. Going to connect to a heated towel bar. Hot towels. Best thing ever. Whoops. Missed a spot down there by the dryer vent. Oh well. The dryer will cover it up. Anyway, the plaster is pretty well on, and tomorrow Ed can install the flooring and tile. And then...toilet! And then I can come home to stay. Hallelujah. Go you for knocking out the plaster. I sincerely hope this project is wrapped up for you soon! Oh God, me too! The plaster is dry today and looks pretty darn good. Watch your email a little later in the winter for an invite to a little "unveiling" get together. I think "stubborn" is probably more the word in this instance. And "sore." God. My hands hurt. Wow, I can't imagine plastering a whole room. Go you. Well, it's a very small room. Much bigger, and I'd have been defeated by it. I learned a lot, though; I'd be willing to try it again sometime, especially if I didn't have to do the ceiling. That's what hurt the most. Gives you a new appreciation for the Cistene Chappel, don't it? So, is the tub going in soon also??? And can you take a close-up pic of your plaster please?? It sounds really unusual and nifty. I'm so excited for you hon! Mmmmmm....heated towel rack. Sounds very Lexian. It totally does! Next plastering job will NOT include the ceiling. I will take more artsy photos of the walls when I have some natural daylight. The tub is in. Just waiting now for toilet, sink, and hot water. I think I may be bathing by Yule.